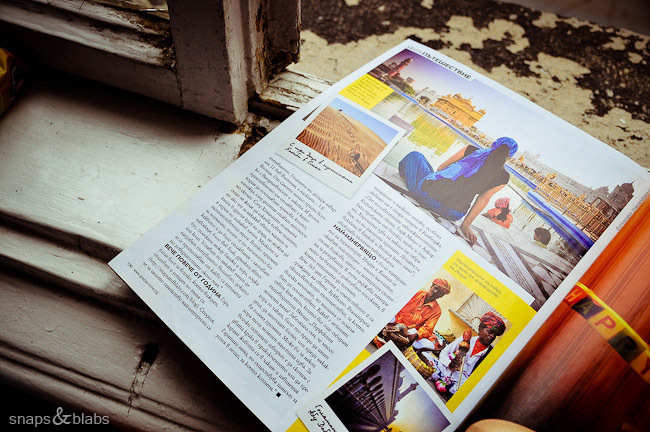 “You have more pages than Matt Damon!” exclaimed Mr.Blab after flicking through the latest edition of Grazia magazine. There, tucked in the later part of the publication, are three pages devoted to our story. For those of you who have little knowledge of Bulgarian, I have done my best to translate the whole article. “Our interview continued via email for weeks, while she was writing from India or sending pictures from Dubai, until it turned into a story of how dreams come true. Today Geri has three kids and a man with whom they had dreamed about that round the world trip, which could happen when the children grow up and they have saved some money in the bank. “We spent hours dreaming, fueled by information from the numerous travel guides and books, which we were collecting, but were slowly wasting away on the shelves. At one point we achieved middle class living, in which we were both working with good incomes, the kids were in school and daycare, madness in the morning, madness in the evenings, weekends spent catching up, cooking, cleaning and getting to know our children, only to repeat the whole crazy ritual the following week, and the one after that. We managed to hold up for a few months like that, but this life was killing us. Why don’t we travel now?, was the question we asked ourselves one day. We had some savings, we were healthy, the kids were good ages – 2, 6 and 10 respectively, and we still hadn’t bought a house. The only thing that was standing in our way was money. Luckily that did not stop us and about four months after we had asked ourselves that question, having sold the car, the furniture, the crap we had collected, fitted everything else in a small storage space, the cash in an account with high interest and with glowing faces, we were flying to Bali, Indonesia. A year on the road with young children is surely an adventure. “I will lie if I say that I have not had worries. I did not worry about the lack of school, friends or our social circle. They are clever, flexible and capable children and I never doubted that they will deal competently with the challenges which surely come from immersing in different cultures and societies or just from living a nomadic lifestyle. My fears came in the middle of the night when while falling asleep I wondered: what if a car hits them, a dog bites them, or if they get sick and its my fault that I have dragged them here and there. In the morning, after a big cup of coffee, I would welcome the realization that bad things happen anywhere. The weight of the experience, which my kids would be getting from seeing the world in a way that very few people get a chance to do, put my normal parental worries in perspective. It turned out that the world is not that scary after all. More than a year now, Geri writes about everything they see, try and feel on the road. She shares that for the whole family, the most interesting spots are the markets and the small streets, especially their favorite old market in Cambodia. “From the famous landmarks the Great Wall of China, the Taj Mahal and Angkor were approved by everyone. I doubt we will be able to forget Hiroshima, although for different reasons. The children are in love with Bangkok and Japan as a whole”, summarizes the traveler. The most frustrating part has been organizing the transport. India and China have proven the most difficult – a lot of population, full trains, lack of central reservation system. In those countries the ability to find tickets has dictated the destination in which the five of them head in. Thank you, Zlatina for the interest, for the wonderful article and for making this such a wonderful experience. Sorry, Matt. Two pages is not that bad really. « So, you break into our apartment in Sofia..
Gibraltar, have you heard of it? I love it! Congratulations! Do you have it posted in Bulgarian somewhere ( I want to share it with my Bulgarians friends as well)? Congratulations! What a great story!! I agree with Nina— you could write the most fabulous book. For reals. Annie, I don’t have it up in Bulgarian. Maybe I will put it up later, good idea. Nina, a book is just a liiittle bit more than an article. I am still not sure I can achieve such a feast. Thank you, Katie and Silvia! Lovely article! 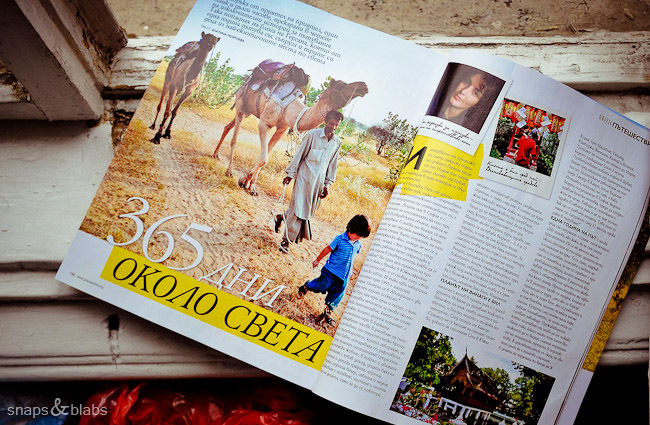 I have been reading your blog for a while now and I am glad to see that your story has reached a magazine! And learning from your experience that there is no right moment to do what you want to, makes me feel more confident. You and your family inspired me to become less obsessive on doing what society expect you to do and start a plan on living a happy and adventurous life (things that most of the people set as a dream that never comes true). My dream is visiting Bulgaria, Portugal and west coast of USA and Canada, and Guatemala… and I am starting a plan for that right now, so thank you for that. You should write a book… I would buy it! Congratulations and regards from Brazil. 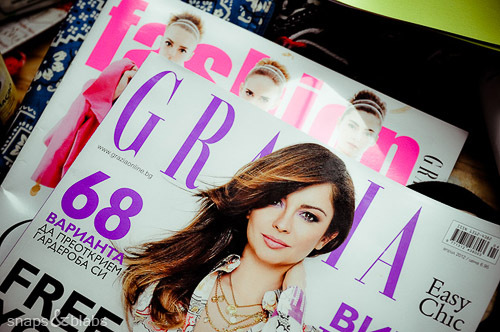 The article will probably be posted at some point in Bulgarian language on the magazine’s web site http://www.graziaonline.bg/ (not there yet). “Our plan has been always written with a pencil in one hand and an eraser in the other.” Read that, like, four times. Awesome. Fantastic article – so inspiring! T.V., magazines, next will there be a movie?! I’ll take a book…ebook even! Jenny, accept my deep apologies. Unfortunately, good intentions are never enough. I am behind on too many things to even begin to list. I hope I manage to tick off at least a small part of them, kimchi especially. Mandy, Liz, Stacey, thank you for the support.